I enjoyed your tribute “Slam Bang Theater” and my good friend, Bill Camfield aka Icky Twerp. I worked with Bill at KFJZ and KTVT in the 50s and 60s. I’m happy you recalled and memorialized Bill and his many talents. But I would like to make a couple of corrections. Bill’s last name is CAMFIELD, not Canfield. It was not Bill who played the character “Cap’t Swabbie,” it was me and I still have the beribboned seaman’s jacket hanging in the closet. I did that character from 1957 to 1964. 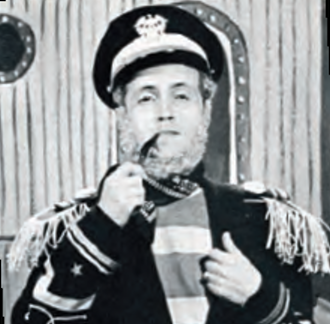 It was actually the late Stan Wilson who created the Swabbie character to host the Popeye cartoons. The “apes” were played by various crew members including Phil Crow and Clem Candelaria. Phil later became the director of the show. I am now 79 and I still enjoy remembering those years in Ft. Worth. Just a final note about Bill’s place in television histor y. He was elected to the Ernie Kovacks Comedy Hall of Fame a few years ago. I was on “Slam Bang Theater” from the very beginning playing an ape and several other characters before becoming the director. Bill Camfield was the best man at my wedding and he is sorely missed. Just a few items that need correction. One of Bill’s characters was “Mortimer Moolah,” not Moneybags as reported in your story. Twerp’s full name was “Ickamore,” not Ickabod and it was George Nolen who played “Captain Swabbie.” After 36 years I retired from KTVT-TV in Ft. Worth. I was also Executive Producer of the Texas Rangers telecasts for 11 years and still do some work for the Rangers and the Dallas Mavericks. I also remember Cap’t Swabbie. (I had assumed that it was Cap’n Swabbie). I was 4 in 1957 when we moved from Oak Cliff to Farmers Branch and my recollection is that in Oak Cliff we couldn’t receive the Channel 11 signal. I recall the crew throwing a bucket of water over Cap’t Swabbie in some of the skits between the Popeye cartoons. Comedy Gold for a 4 year old. Over the years, I’ve searched the internet for hints of these distant memories of childhood including Cap’t Swabbie, This is the first hit I’ve found. I remember Cap’t Swabbie on the set of a ship’s bridge standing behind a ship’s wheel. Every now and then one of the handles of the wheel would break off in his hand, and being live TV, he’d just bluster through it, singing a bit of Gilbert and Sullivan under his breath. I really enjoyed the show as a kid, and it’s great to learn a bit more about the team at Channel 11 that produced this delightful, children’s programming. Kathleen’s Kitchen on North Travis Street has become such a fixture in Sherman that it is easy to forget the restaurant hasn’t been serving strawberry salad and potato soup forever.